Bob and Ginny Childs loved their spacious five-bedroom home in Churchville, with one glaring exception: a master bathroom they considered devoid of personality and fraught with wasted space. 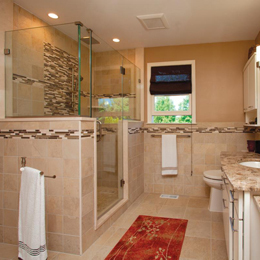 That changed in 2012, when the bathroom received an ambitious renovation, complete with the addition of elegant cabinetry and beautiful tile work, orchestrated by the masters at Diamond Kitchen & Bath. “Now it’s the Taj Mahal of bathrooms— gorgeous, contemporary and very warm,” says Ginny Childs. She was not surprised by the end result, given a similar result when the Childses hired Diamond Kitchen & Bath to renovate their kitchen years earlier. Diamond Kitchen & Bath has earned its place as one of the region’s most sought-after design ers of beautiful home renovations, as well as a leading provider of high-quality, American- made home furnishings. Even so, such quality does not necessarily come with a high price tag, according to Reisbord. Diamond Kitchen & Bath has options for every homeowner and every project, from the basic to the ornate. It does not offer, however, options of low quality or, worse, something that can actually harm the homeowner or detract from the value of their home. This includes cheaply made cabinetry of Chinese origin, which is becoming an unfortunate trend in the cabinet industry. Many Chinese cabinet brands are laden with formaldehyde, sulfur and other chemicals that are banned by the U.S. Environmental Protection Agency but are sometimes hard to regulate. These noxious chemicals can result in health problems such as headaches, dizziness and nausea, among others. Also, Chinese-made cabinets often have dull, thin, worn-looking finishes that simply do not last, and they almost never carry a warranty. This is why Diamond Kitchen & Bath works only with North American manufacturers it knows and trusts. “There’s a big difference in quality between the products we carry and the Chinese cabinetry that’s flooding the market,” Reisbord says. “The funny thing is, we can compete with these products on price with superior products that were made in the United States. There’s no reason to accept something of lesser quality that’s not going to last, especially when it’s made outside of the country. Whether a homeowner’s goal is to purchase a new faucet or have a kitchen or bathroom fully renovated, Reisbord welcomes prospective clients to visit his company’s Huntingdon Valley design center and showroom. There, they will find countless flooring options, 11 different lines of cabinetry and an array of other furnishings. These include a number of “green” products made by trusted manufacturers, from faucets, tubs and showers to cabinetry hardware and natural stone such as granite and quartz. Brad and Stacy Wertz of Richboro are examples of clients who have turned to Diamond Kitchen & Bath for various projects. The firm recently completed gorgeous renovations of the kitchen and master/hall bathrooms, as well as a redesigned fireplace/finished bar as part of a reinvention of the family room. Based on their positive experience, the Wertzes would recommend Diamond Kitchen & Bath to anyone. Yardley homeowners Natasha Adamov Falcone and her husband, Brian, had a similar experience. Until they met Reisbord, they were apprehensive about partnering with a contractor to help them contemporize their home’s kitchen, making it stand apart from the traditional kitchens found in many homes throughout Bucks County. Ask Ginny Childs, owner of the Churchville home that Reisbord and his team helped revitalize, and she’ll agree that Diamond Kitchen & Bath’s passion is apparent. For this, she has many reasons to be thankful.